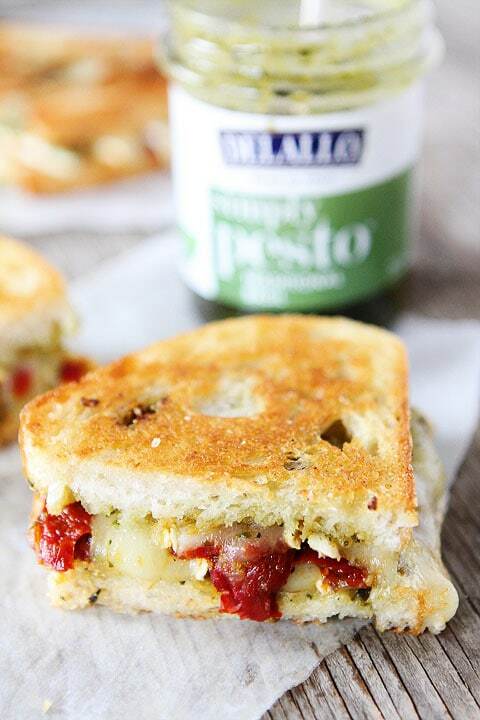 Brie, Pesto, and Sweet Pepper Grilled Cheese-warm, melty brie with basil pesto and sweet red peppers! This simple sandwich is great for lunch or dinner! Today is the last day of National Grilled Cheese Month. I might shed a tear. I am sad to see this month go. I’ve loved having an extra excuse to eat grilled cheese sandwiches. I have been craving grilled cheese sandwiches since the beginning of my pregnancy so I have fully embraced grilled cheese month. We still have one more day to celebrate and we are going out with a bang! 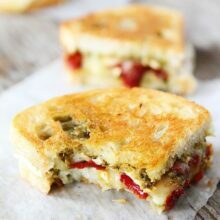 There is nothing wrong with a classic grilled cheese, but today I am sharing one of my new favorite grilled cheese recipes, a Brie, Pesto, and Sweet Pepper Grilled Cheese Sandwich. You NEED to make this sandwich today. Grilled cheese month insists and so do I! You only need five ingredients to make this incredible sandwich. 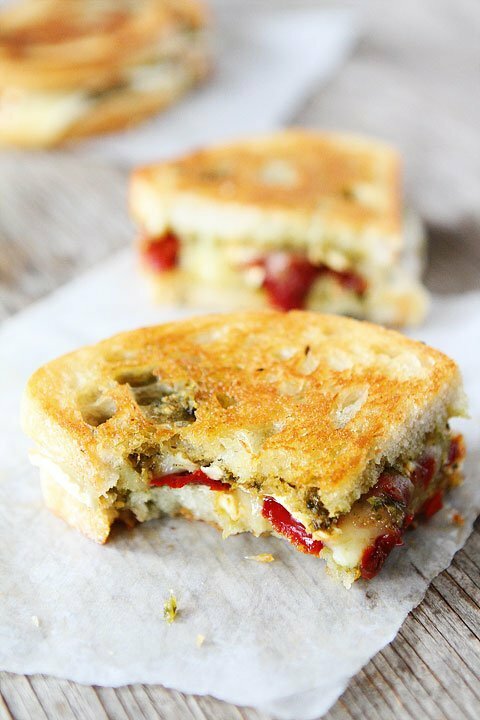 Bread, butter, brie, pesto, and sweet red peppers. That is it! Easy peasy! I was feeling lazy so I busted out my favorite jarred pesto-Delallo’s Simply Basil Pesto. DeLallo’s pesto is made with handpicked Ligurian basil in an aromatic blend of olive oil, crunchy pine nuts, cashews, garlic and two celebrated Italian cheeses: Parmigiano-Reggiano and Pecorino Romano. It is the real deal! I also used DeLallo’s Sweet and Tangy Sun-Dried Peppers. They are super sweet…better than candy! I love them! 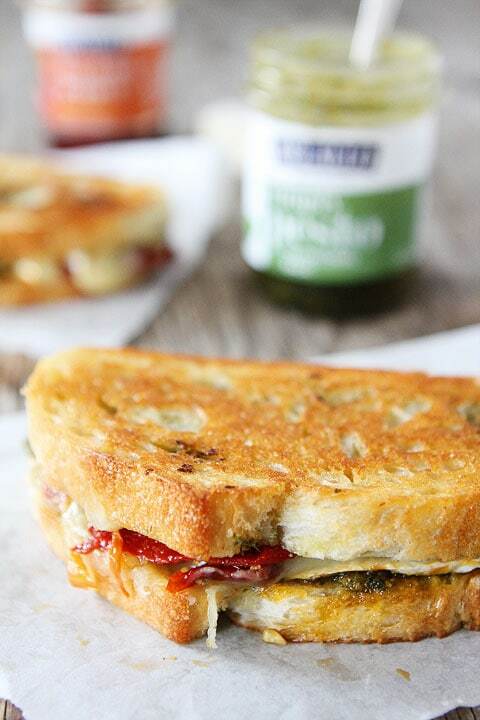 If you are a go-getter and want to make your own pesto, our Spinach Basil Pesto would be great on this sandwich. You can also use roasted red peppers, but I highly recommend DeLallo’s sweet peppers. 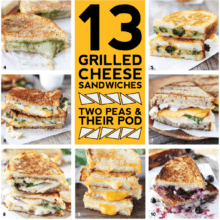 They are my favorite and are so good in this grilled cheese sandwich! 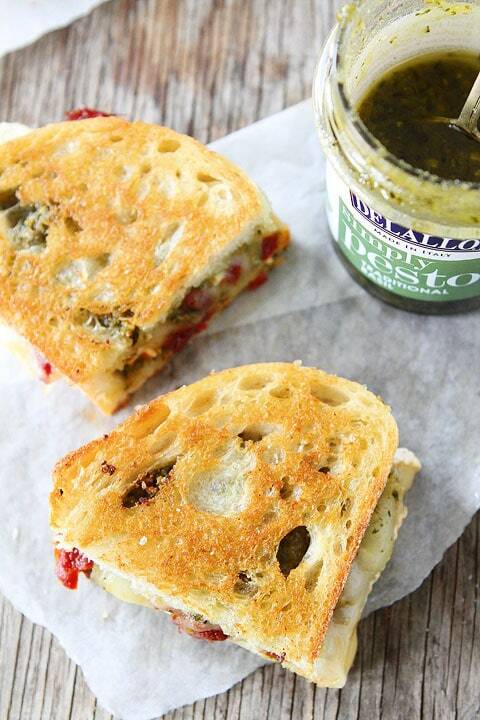 Crunchy, buttery bread on the outside with creamy, melty brie cheese, basil pesto, and sweet peppers on the inside. This is grilled cheese perfection right here! 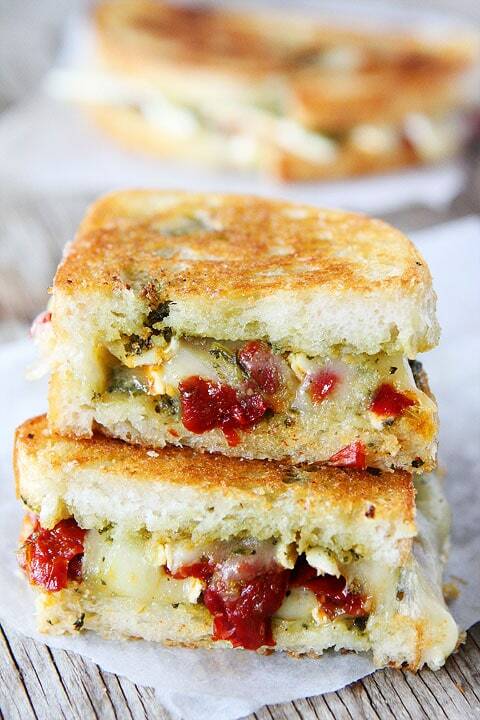 Grilled cheese sandwich with brie, pesto, and sweet red peppers! This sandwich is great for lunch or dinner! Butter the outside of each slice of bread. Spread basil pesto on the inside of each slice of bread. Place the peppers and brie cheese slices on top of one piece of bread. Top with the other slice of bread. Place the sandwich, butter side down, on the hot pan. Grill for 2-3 minutes or until golden brown. Flip and cook until golden brown and the cheese has melted, about 2 more minutes. Serve immediately. Disclosure-this post is in partnership with DeLallo, but our opinions are our own. OMG, this is brilliant! 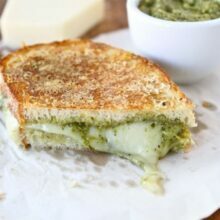 I LOVE pesto and I totally have never thought of putting it on Grilled Cheese. You may have just changed my life girl! Pinning and face planting STAT! the ultimate grilled cheese, for sure!! 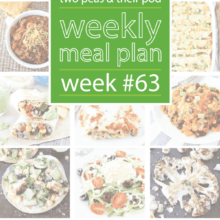 this sounds simple wonderful and bursting with flavor! You can never be too late to the grilled cheese party. This sandwich might just be my last hurrah before I start to celebrate Cinco de Mayo. And the pesto party? I’m so there. I’m planting over 20 basil plants this year (with spinach of course). Great pics as always, so inspiring! This looks fantastic! I love jazzing up my grilled cheese. Ohhhhh. This Grilled Cheese looks GREAT! I love everything about this cheesy sandwich. You combined three of my very favorite things and smooshed them between two slices of buttery bread–nom! That buttery bread is calling my name!! So pretty!! This looks KILLER and like the perfect lunch. Yum! DROOLING!! This looks beautiful and loooove the brie!! I used President Cheese Brie, which is pasteurized. Thanks for your concern though! 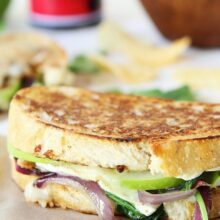 This sandwich looks wonderful…so delicious and full of rich flavors! Love it…thanks for sharing! What a killer grilled cheese, love these flavors! Yum! Talk about the perfect lunch. I could definitely go for one (or two) or these! Oh lordy, does this look mouthwatering! What a brilliant combo of color and flavor in this grilled cheese. I could go for a big bite! Such a wonderful combination ! Can you share the brand/source for the bread? I’m in utah too so even if it’s local the source would be great. The whole sandwich looks fantastic, but I have to admit the bread itself is what looks crazy good. Thanks! Are there other Dellago products you recommend? These look so delicious! I can’t wait to try these grilled cheese masterpieces! Pinned! Uhhhhhh yeah this is happening. Love me a good gourmet grilled cheese! 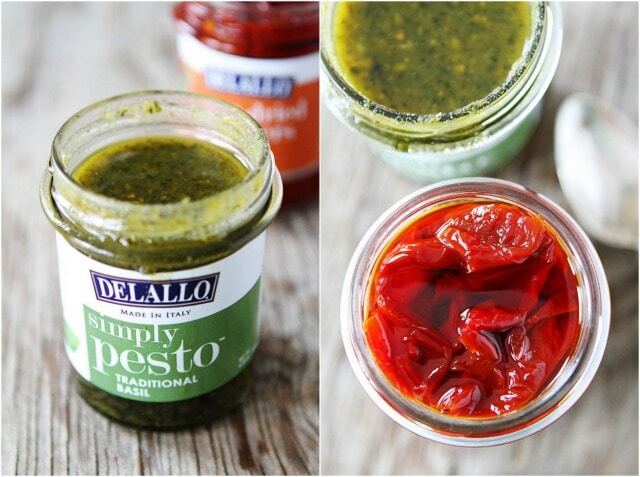 I pretty much always put pesto in mine but have never used peppers in one, I must fix this asap! Talk about a grown up grilled cheese. Lovin’ it! YUM! All of my favorites in one sandwich. Looks delish!